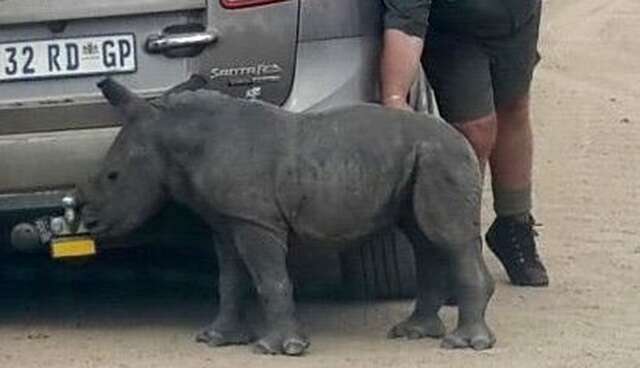 A baby rhino named Donnie was seen trying to adopt passing cars as his new mommy after poachers killed his actual mother in Kruger National Park in South Africa. Donnie trailed after cars as they drove along the dirt road and rubbed up against them as they stopped, hoping one of them would take him in. This behavior is known as imprinting, which is common when a small animal loses his mother and cannot survive without finding a replacement. Debbie English, a fourth year veterinary science student, and her father Don, a regional ranger at the park, came across the baby rhino during a trip to the area. Since Donnie was only two months old, Don had to tranquilize him and have him airlifted out of the park for the rhino's safety. The poor little fella flatlined during the trip, but was resuscitated and is reportedly recovering well. He's drinking milk and playing, but it'll take a little time before he's able to be weaned off the milk and let back into the wild. He's still without a mother, though, which is something he can never replace. Visit SavetheRhinos.org for more information on how to help other rhinos in need.